Inspired by the post at but she’s a girl…, I thought I’d jot down a few of my own notes on how I too use Tinderbox as a Daybook. One of the more useful things I’ve been doing with Tinderbox is to keep a running log of things I do each day. This “Daybook” has become a way to track billable time for clients, record technical notes, and keep a basic journal. Any decent outliner could do this, but Tinderbox lets me tweak things as much or as little as I want. Prototypes and Actions make all the difference. I have a few tweaks that help keep things in order for me. Most of these come in the form of the tremendously useful Tinderbox feature, Prototypes. 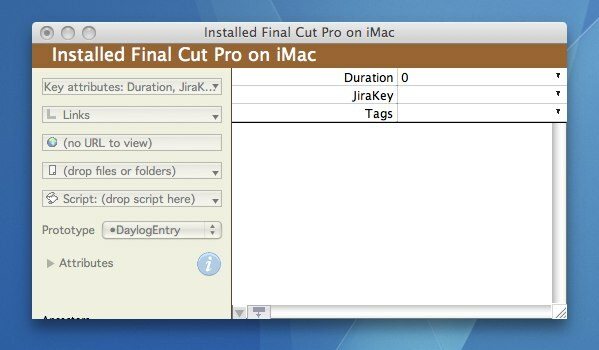 The *DaylogEntry prototype uses custom attributes set as Key Attributes for easy entry (Duration, JiraKey, and Tags). We use JIRA as an issue tracker and if I’m working on a specific issue I record the key with each note. Displaying it as part of the name in the outline helps when recording timesheets. Here’s what a DaylogEntry note looks like. 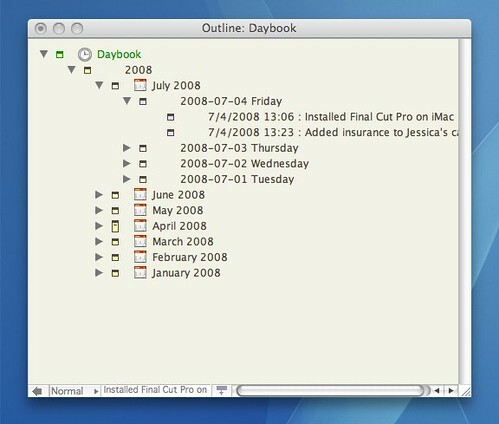 The process of adding daylog entries starts by creating a container for that day. This is done by hitting Return twice to create the container (which is automatically named with the current date) and then Command-Option-O to open the container in its own outline. After that for each entry it’s a simple matter of hitting Return to start a new entry, then closing the window. Everything ends up named nicely and sorted by time of day. I’ve been doing this since the beginning of this year and have a total of 1235 entries so far with no apparent impact on Tinderbox’s performance. My Tinderbox Daybook has become a surprisingly valuable resource. It’s amazing how much information is available over time simply by recording minor events each day. I haven’t started mining this information in any formal way yet. Who knows what I’ll find!